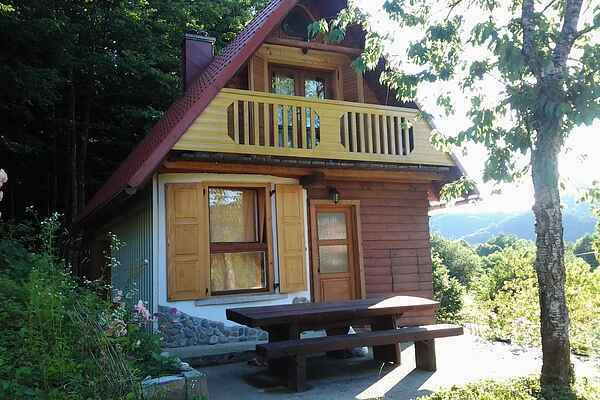 Vacation house Vesna is situated in the mountain region of Croatia, Gorski kotar, next to the river Kupa.Located by the forest it is woven into the natural environment of the river Kupa valley. It is a rustically decorated wooden house featuring big living / dining room on the ground floor and 2 bedrooms each with balcony on the first floor. Big garden and wooden, covered terrace with open fire place is ideal for your relaxing moments in a quiet village with few cottages around. Vacation house Vesna is suitable for people who adore nature, for fisherman, hunters, climbers, kayakers, hikers or just families escaping from traffic and stress. The nearest town is Brod na Kupi, 3 km away where you will find a bakery, grocery shop, restaurant and a post office. Within the driving distance of 1 hour you can visit National park Risnjak as well as Adriatic cost towns of Crikvenica and Opatija. The island of Krk, the biggest Croatian island is also near and accessible by car. The vicinity of Adriatic sea gives special charm for people wishing to combine peaceful vacation with water sport activities. Also, National park Plitvice lakes and capital of Croatia Zagreb can all be visited in one day trip.